“Protecting the Environment.” That’s one of the rotating headlines used at the White House website to announce this photograph, taken at a photo-op last week to promote the education war environmental presidency at the Patuxent Research Refuge in Laurel Maryland. 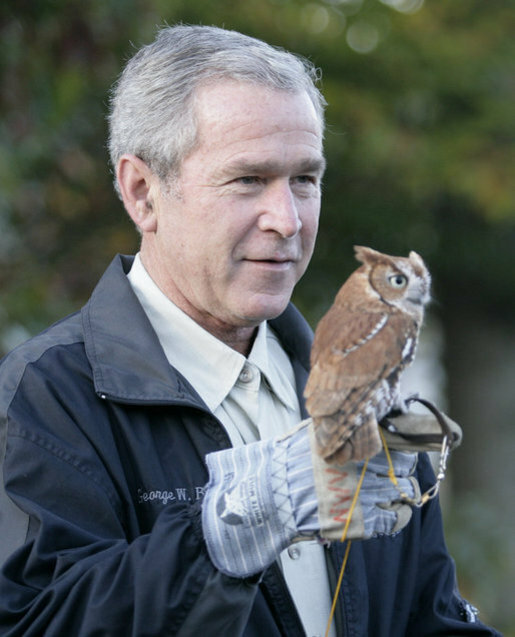 The occasion was for the president to sign an executive order protecting striped bass and red drum fish populations, as well as to announce tax incentives designed to protect migratory birds like the screech owl seen here posing with the president. It’s hard to know who seems more out of place and uncomfortable in the photograph, but a good bet is that it is our feathered friend. And probably with good cause. One only has to recall the president posing with children in the weeks running up to his veto of the State Children’s Health Insurance Program to understand why — if children can be used unceremoniously as props against their own best interests, we can only imagine what is in store for lesser beings. On the face of things, of course, the situation here appears to be quite different. After all, the president really does seem to be looking out for the interests of migratory birds, proposing a “conservation tax incentive” to reward private landowners who will provide much needed “stopover habitats” for the birds on their annual treks south and north. But look again, this time not at the picture, which presumes to show a compassionate conservative conservationist, but at the words used to situate the policy in the larger context of U.S. environmental policy. 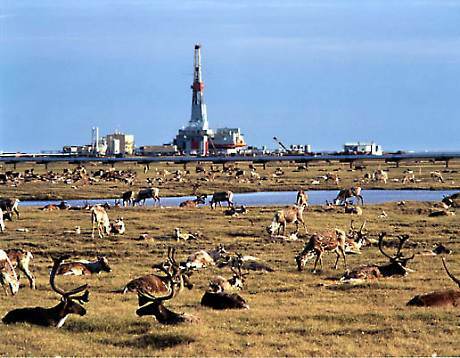 Administration efforts to allow drilling in the Arctic National Wildlife Refuge were (temporarily?) thwarted by the Senate in 2005. Still, it is hard not to be cynical as we imagine “cooperative conservationism” as a euphemism for “cooperating” with the private interests of the oil, natural gas, logging, and mining industries. But, of course, it is not really cynicism, because we know that this is exactly what is being promoted. And too, we know that however factually accurate, the picture of the owl and the president is a lie designed to misdirect our attention from a larger truth. We’ve seen it all before. I have a bumper sticker in my office that reads “To Hell with the environment. Vote for George Bush.” It is from the late 1980s and refers to the father, but in retrospect it marks an attitude far more appropriate to the son. The apple doesn’t fall far from the tree. Photo Credit: Eric Draper/White House, and Deepblade. And with thanks to Phaedra Pezzullo for providing background information and web links on current U.S. environmental policy. Be sure to see her books Toxic Tourism: Rhetorics of Travel, Pollution and Environmental Justice (U. of Alabama, 2007) and Environmental Justice and Environmentalism: The Social Justice Challenge to the Environmental Movement, co-edited with Ronald Sandler (MIT Press, 2007). ← Previous PostA New Deal for Gobal Warming? Well, if he was making a point about helping migratory birds, he should have posed with a migratory bird. Eastern Screech-owls don’t migrate. Just another example of the inability of this presidency to deal with the reality-based community.